Here's a beautiful Valentine's Day apron for the love of your life! If she loves to cook and takes pride in her kitchen, this pretty DII pink ruffled apron may be the perfect Valentine's Day gift. This bold, halter-style apron measures 31 by 42-inches and is made of poly-taffeta. It easily handles the two tasks put to an apron, function and fashion, and is perfect for a hostess. "It's not just an apron, it's an accessory!" 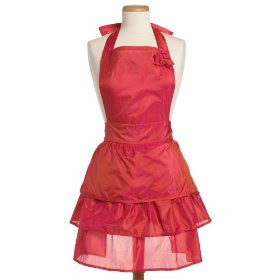 Buy this DII Pink Ruffle Apron from Amazon. Visit A Sweet Heart Apron For Valentine's Day.